Spring has sprung in Maine, so that means that the husband and I have been getting out even more than usual. We started the weekend off right with a trip to Harding Lee Smith’s Front Room Restaurant. We’ve eaten here before and really enjoyed it. We went in with fish on our minds and luckily we found their specials to be surprisingly fresh catch oriented. To celebrate the weekend we decided to start with some cocktails. I got my usual, THANK GOD IT’S THE WEEKEND drink– a Cold River Vodka Martini, Extra Dirty. If you aren’t from Maine, or even if you are and haven’t tasted it, I think Cold River Vodka is the very best Vodka on the market. The fact that it’s incredible AND locally sourced makes it even more special. It’s incredibly smooth and gluten-free for those who have allergies or sensitivities. Mark went for a Manhattan, perfect. His usual pick of poison. He has become increasingly obsessed with finding where in Portland serves the “perfect” Manhattan…and I think he was very pleased with the one they serve up at the Front Room. 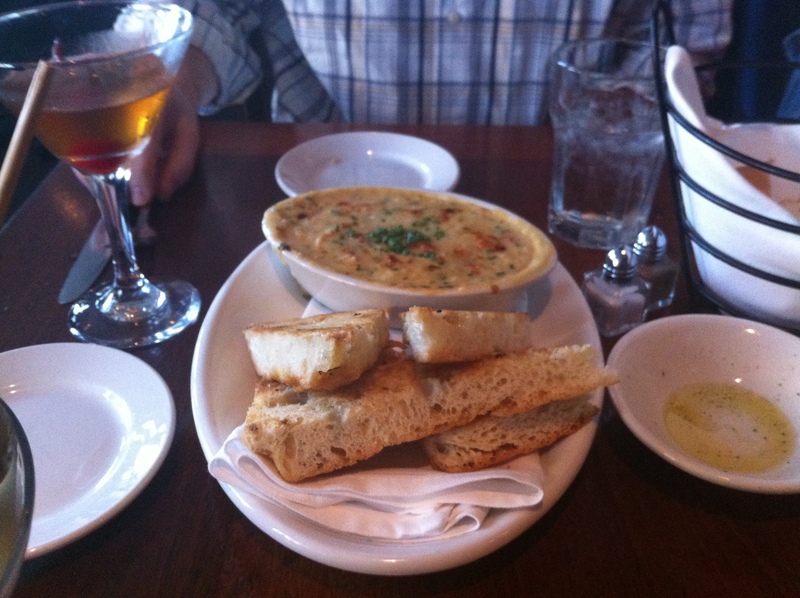 After getting our cocktails we decided to treat ourselves to the crab dip appetizer. I am a huge fan of crab, and Mark always swears he likes it better than lobster (is he insane? Yes, I believe he is). It was a tasty creation served with toasted focaccia for dipping. It was runnier than other crab dips I have had with just a touch of spice. It had large chunks of deliciously fresh crab meat. I general, it was a solid dish and I would rate it as about a I would say it was about a 7.5/10. It wasn’t creamy like others I have had, but the mild spice addition was welcome and really brought out the natural essence of the crab meat. We ate it all in about 4 minutes. After that we were ready for our main course selections. We both decided to order something from their nightly special menu. 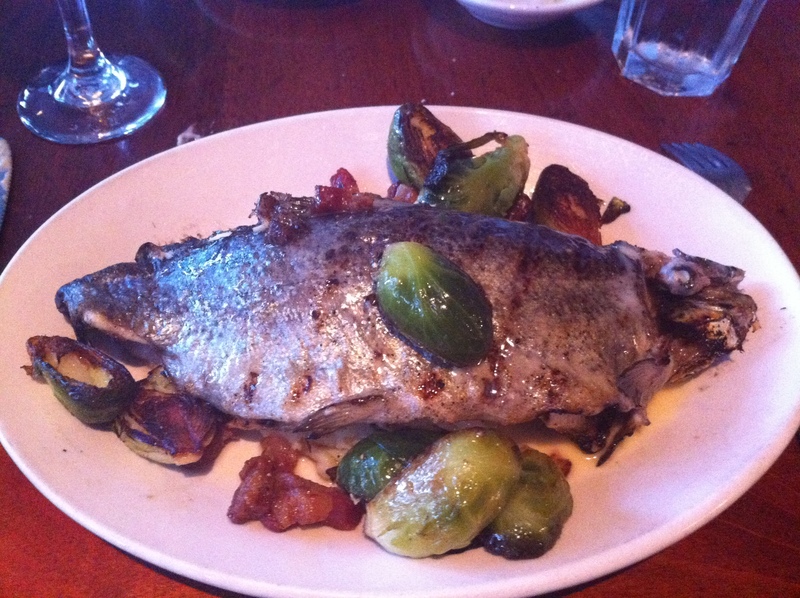 I opted for the Whole Grilled Trout with Rosemary Mashed Potatoes and Fresh Brussel Sprouts. This dish was exceptional. It was undoubted a 10/10! Cooked to complete perfection and the accompaniments were complementary, not in the least bit overpowering. The trout was grilled with just a touch of olive oil and a sprinkle of salt, and it was exactly as it should have been. Overall, a perfect fresh catch dish. 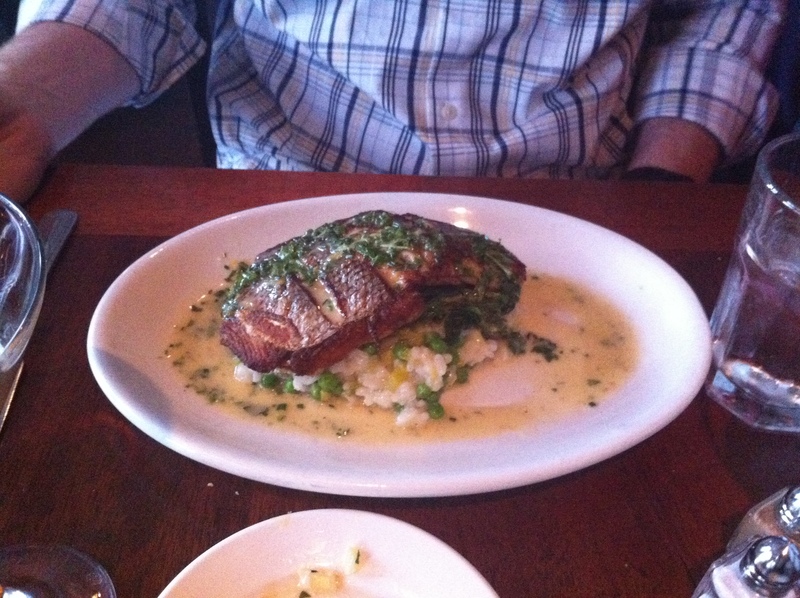 Mark had never had Sea Bass before and decided to give it a try. I had initially wanted to order that when he was toying with the idea of getting scallops, but he decided to give it a try, hence I ordered the trout. We both made the right choice, so I couldn’t complain. When his entrée came, it was grilled to perfection. He felt it was a 9/10. The lemon pepper flavoring on top wasn’t the least bit salty or overpowering. It was subtle lemon flavor with just the right amount of pepper. He absolutely loved it. The parmesan risotto was a nice complement. There wasn’t a strand of rice left on Mark’s plate at the end. We were both about to explode when our waiter came to see if we had room for some homemade Red Velvet Cake with Cream Cheese Icing. I wished I had saved some, but alas…there is always next time! Overall, The Front Room is a very good deal for the quality of food. They don’t accept reservations so there can be a wait on the weekends, but just get a drink. A bonus if you get there between 4-6 on Friday–Happy Hour! They have $2 glasses of house wine and a number of other beer and cocktail specials. Both of our entrées were $19. Their daily special list could be a menu in and of itself, and makes me wonder why they even have a traditional menu at all. We will be back again this summer for sure, and can’t wait to give it a whirl at brunch!